Syncretic religion mixes two separate religious traditions—say, Christianity with African Orisha worship—and combines them in a new way that honors both traditions. Garcia McCall has mixes Aztec and Mexican mythology with the ultimate quest story, The Odyssey and come up with a charming, richly layered YA novel. In a small Texas town, the 5 Garza sisters find a dead body floating in their summer watering hole. Odilia, the eldest of the girls, has a vision of Llorona, the mythic weeping woman, who tells her that she and her sisters must return the man’s body to his family in Mexico. She gives Odilia a pair of magic earrings that allow her to call on the magical intervention of Tonantzin, the sacred Aztec mother goddess, should they need it. Since the girls have a grandmother who lives in Mexico, they decide to go visit her as well. Thus begins their odyssey. Along the way, they have many adventures, including run-ins with wily sorceresses, lechuzas (owl-women), evil warlocks and chupacabras (goat blood suckers). Their adventures are thrilling, full of magic and sometimes quite funny. Summer of the Mariposas is more than just a high concept work of fiction. The characters, even the magical ones, are real. The five sisters have distinct personalities—Brave Odilia, headstrong Juanita, the twins Velia and Delia who are both bratty and trade on their beauty, and the naïve 10-year old Pita. Odilia is the narrator of the story, and Garcia McCall manages to be both lyrical in her descriptions while also capturing the voices of twenty-first century teenagers. In addition to being a quest story, it is also a story about families and complicated relationships. 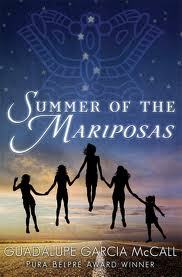 Summer of the Mariposas weaves the mythic and the mundane together seamlessly. It is a superior work of magical realism. I look forward to seeing what Guadalupe Garcia McCall will write next.